But what would happen if a National Socialist state developed in America today? How would it be instituted? What changes would it bring to the nation? What would happen to society? What would the goals of the new state be? How would the party be organized? What ideals should its Leader exemplify? What is to be done with the corrupt judiciary? What kind of budget will a new National Socialist Party and its affiliates need? How would local chapters be organized? How will initiates be chosen? The book isn't appearing in the Amazon linked site. Word on the Street: Obummer is going to announce amnesty for the (mexican) illegals tomorrow night. Got views in your latest podcast? The feds are asking for something like 205 months and Bill has asked for the minimum under the guidelines, I think it is 95 months. Maybe a good thing - Marcus Faella, the leader of the American Front group that was tied with this case from the start, only got six months at his Nov 10 sentencing. He was facing 30 years. 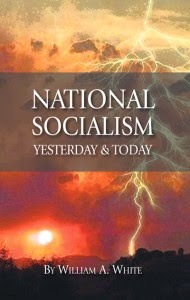 So to must our understanding of national-socialism.